56 Leonard Street, the 830-foot-high residential tower announced four years ago for the southwest corner of Church and Leonard streets. Tribeca's sleeping giant is about to rise. Four years of construction is expected to begin next week on the long delayed 56 Leonard Street, the 830-foot-high residential tower announced four years ago for the southwest corner of Church and Leonard streets. For more than three years, the building's completed foundation has sat barren while the recession-stymied developer, the Alexico Group, sought financing to complete the project. The 57-story building, with its irregularly jutting glass facade that resembles a colossal Jenga game, will soar high above the low-rise Tribeca streetscape, unchanged from the design that was unveiled in September 2008. Back then, Alexico was selling its 145 condos at prices that started at $3.5 million and ranged upward to $33 million for a 6,300-square-foot penthouse. 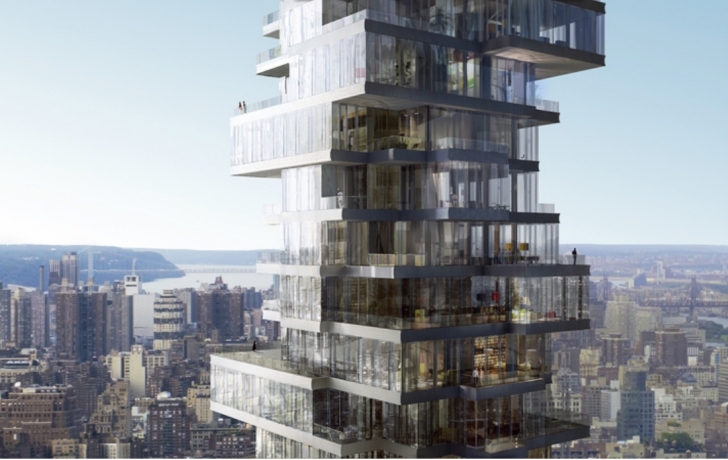 The project, designed by the firm of Herzog & de Meuron, had been greeted unhappily by some in the community when it was introduced. They said it was grossly out of scale with the neighborhood and an unsuitable neighbor to the historic district. Long-time Community Board 1 member Bruce Ehrmann echoed that sentiment on Wednesday, when representatives of the construction firm in charge of the project, Lend Lease US Construction Co., came before Community Board 1’s Tribeca Committee to give a preview of their work schedule. Alexico bought the site for $135.5 million from New York Law School, whose library had stood there. The school used the money to build its new library nearby. "No one thought that New York Law School would destroy their own library in order to put up a monstrosity," Jim Stratton, a former Community Board 1 member who worked closely on the rezoning with the city, said at the time Alexico announced its plans. But the concern now is the impact of construction on the surrounding neighborhood. Committee chair Peter Braus called it “shocking” that construction will last four years, including nearly two years for the facade alone. “It’s a very complicated structure,” said Tony DelGreco, a vice president of Lend Lease (formerly Bovis Lend Lease ) and the manager of the project. DelGreco said that the first 10 floors will go slowly because of the large cantilevered apartments. DelGreco said construction will begin next week on the north side of the site where workers will begin the three-month job of chopping up the sidewalk and putting in utility vaults for Con Edison. It will take more than a year-and-a-half, beginning in December, to build the superstructure, with facade work to start next July. The building is scheduled for completion in Spring, 2016. Lend Lease has set up a phone line for construction-related complaints, which they say will be answered within "24 to 48 hours": 212-448-3982. Submitted by Melissa Romero on Wed, 10/24/2012 - 9:19pm. This will be the highest builder ever if this will finally construct. How many construction workers do you need for this project? I guess this will be done together with the steel truss bridge that will be built next year and heard to be the longest bridge soon. Submitted by selenamurphy on Tue, 10/23/2012 - 8:49pm. This building is unique. Its structure is a lot different compared to many buildings out there. Is the construction have started? I would like to ask about this for my plans in quality assurance certification with this structure.